Whether it's on the Web, in a book, or live in-person, the most effective solutions are those that unexpectedly grab our attention. David Langton and Anita Campbell identify eye-catching and thought-provoking marketing and PR tips, ideas, and creative "stunts." This compendium of winning ideas will inspire small business leaders, creative professionals, and students. Award-winning visual communication designer David Langton has worked for a range of businesses from Fortune 500 leaders to small businesses. Anita Campbell, an internationally known small business expert, reaches over 2 million small business owners and stakeholders annually. Through case studies, photos, and illustrations, Visual Marketing displays creative marketing campaigns that brought attention to small businesses in unique, compelling, and unexpected ways. With Visual Marketing, you'll discover 99 powerful strategies for capturing the attention of your potential customers. 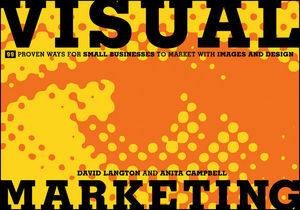 DAVID LANGTON is a visual communication designer, blogger, and author on visual design. He has more than 20 years experience providing conceptual direction for Fortune 500 companies and small businesses. He is cofounder of?Langton Cherubino Group, a communications design firm, based in NYC, dedicated to improving the way that businesses and their audiences interact. ANITA CAMPBELL is CEO and founder of Small Business Trends, smallbiztrends.com, an award-winning website reaching over 300,000 small-business owners each month. She hosts a weekly Internet radio podcast show featuring interviews with small-business owners and entrepreneurs and owns BizSugar, another small-business social media site.